Place drumsticks in a 4- or 5-quart slow cooker. In a medium bowl, combine hot sauce, tomato paste, vinegar, and Worcestershire sauce. Pour over chicken in cooker. Meanwhile, in a small bowl, combine sour cream, mayonnaise, blue cheese, and cayenne pepper. Reserve half of the blue cheese dip (3/4 cup); store as directed below. Cover and chill the remaining dip until ready to serve. Using a slotted spoon, remove drumsticks from cooker. Skim fat from cooking juices. Reserve eight of the drumsticks and 1 cup of the cooking juices; store as directed below. 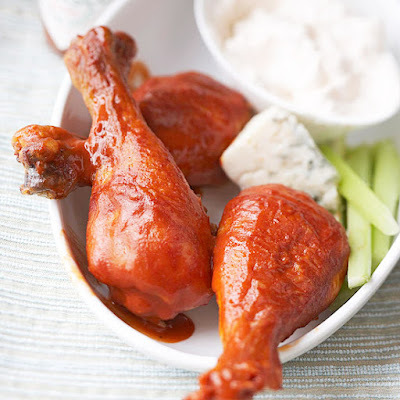 Serve remaining drumsticks with some of the remaining cooking juices, the remaining blue cheese dip, and celery sticks.